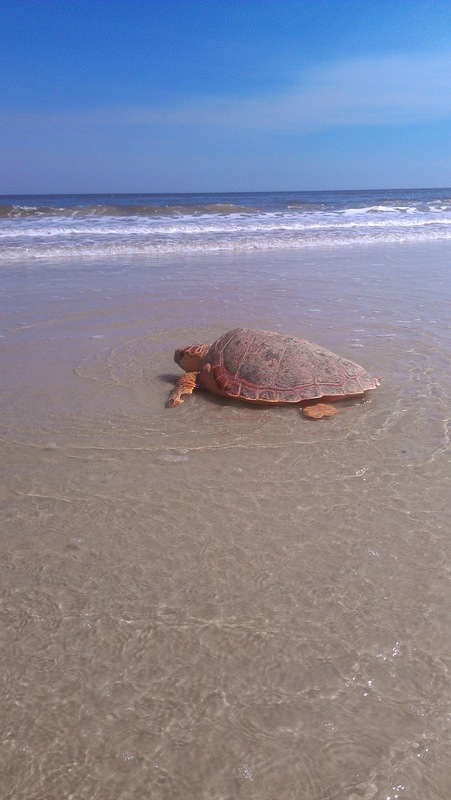 We received great news last week from the Georgia Sea Turtle Center (GSTC). 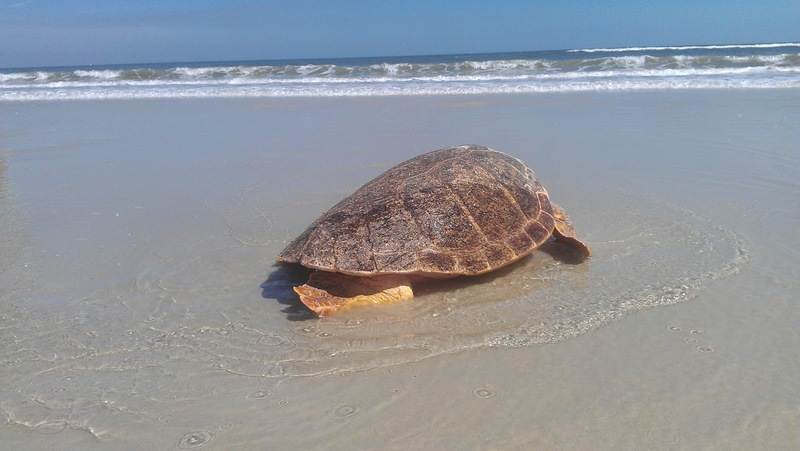 Our large female loggerhead "Biscuits" has been returned to her ocean home! The photos were kindly sent to us from the folks at GSTC. Short video of "Biscuits" heading back to the ocean. Video courtesy of Georgia Sea Turtle Center. 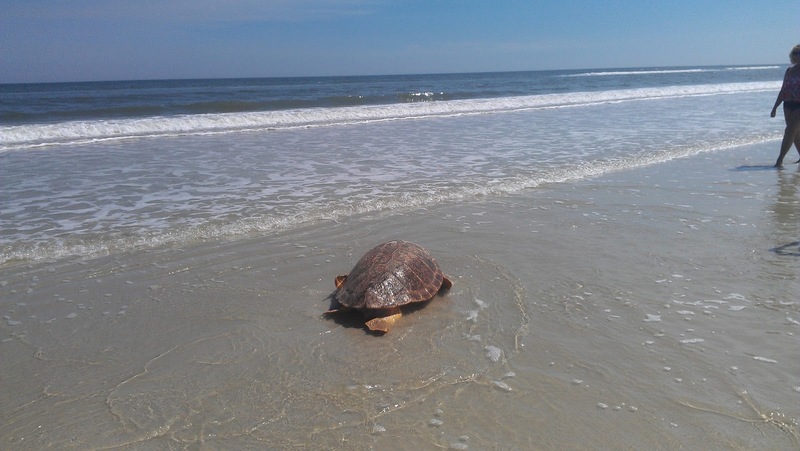 One of our other turtles, "Snagglepuss" (087) that made the trip to Georgia with Biscuits was also released. Good luck, "Biscuits" and "Snagglepuss"! 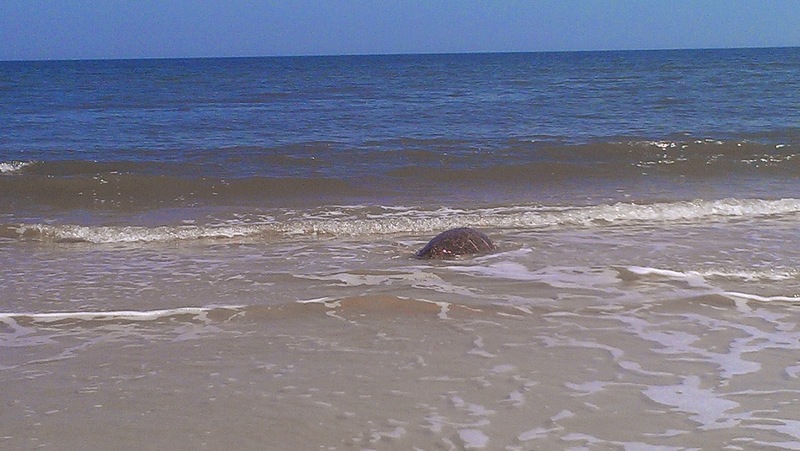 We've been following turtle #067—a rescued Kemp's ridley sea turtle—during rehabilitation after it washed up on a beach with hypothermia this fall. 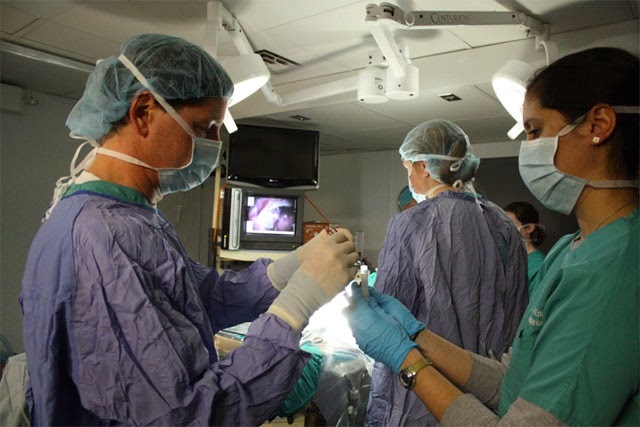 First it took a field trip for specialized diagnostics, then it had a bronchoscopy. 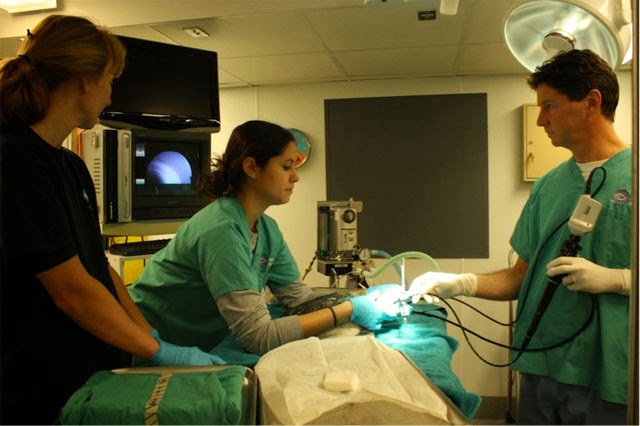 Today's post is about a laparoscopy. 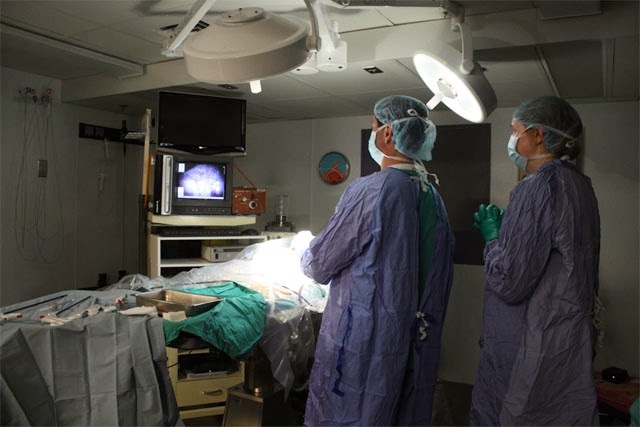 Most of you are probably familiar with this type of procedure as many of the human surgeries nowadays are performed laparoscopically. 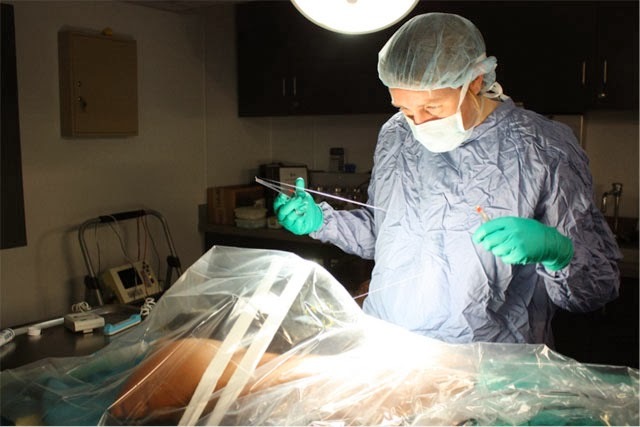 This eliminates making a long incision in order to get to a certain organ. Instead, you make one, or a few small holes just big enough to guide the scope and whatever other surgical instruments you need to use. 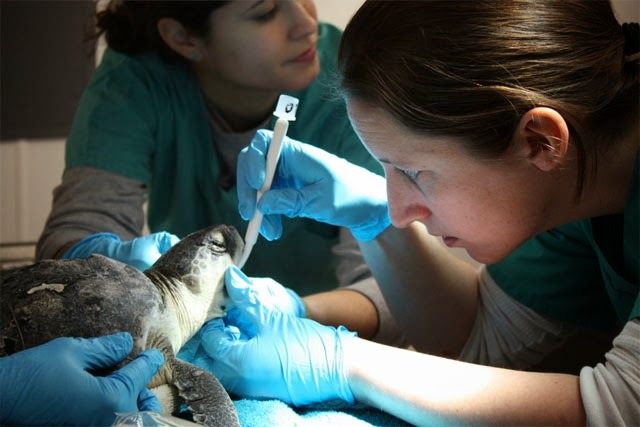 Our turtle just needed one small incision in order for our veterinarians to insert the scope to the turtle’s coelomic cavity (the inside of the body where all the organs are). 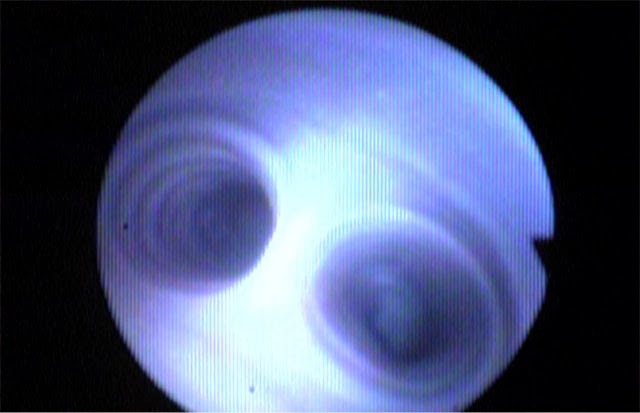 shows what the scope camera sees inside the turtle. The first thing we found out about #067 was… it’s a girl!! Normally you cannot tell if a young sea turtle is a male or a female because they do not have any external body features that would be different. 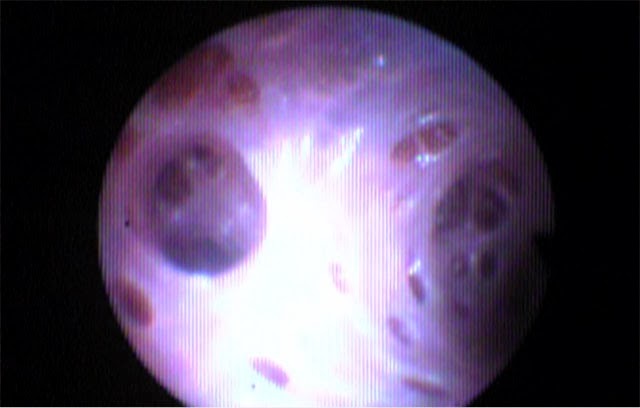 However, with the scope we were able to see the ovaries, which is a female reproductive organ. 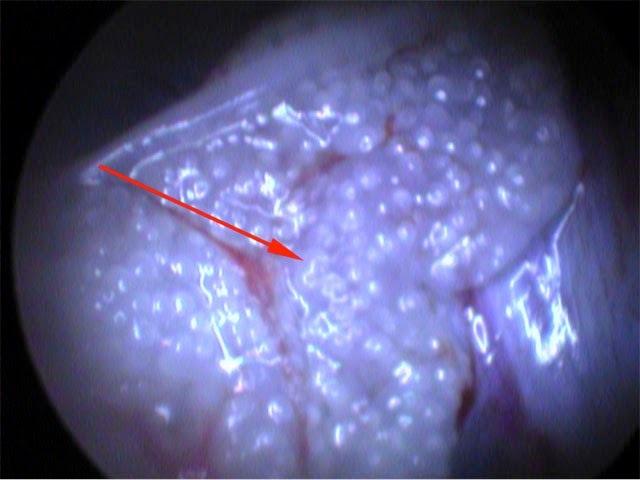 This picture shows #067's ovary, which looks like a bunch of little balls called follicles. The arrow is pointing out one of the follicles. After a few minutes we found the lungs and started visually inspecting the tissue. 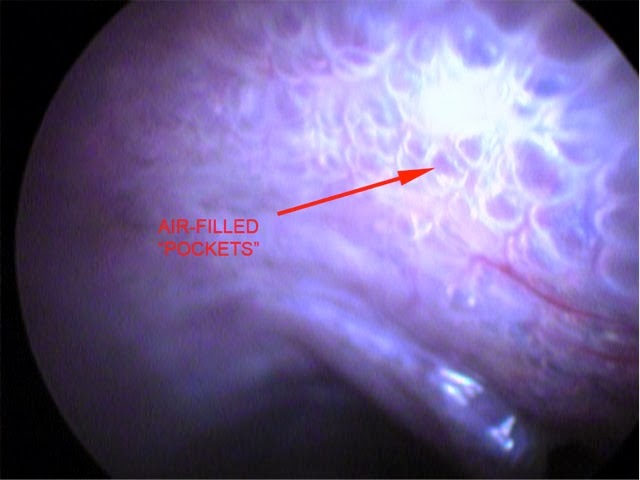 Most of the lung area looked normal and healthy, however, our veterinarians did find an area in the right lung with some diseased tissue. They decided to sample a small section of that lung for further tests. where the lung inflate with air during a breath. 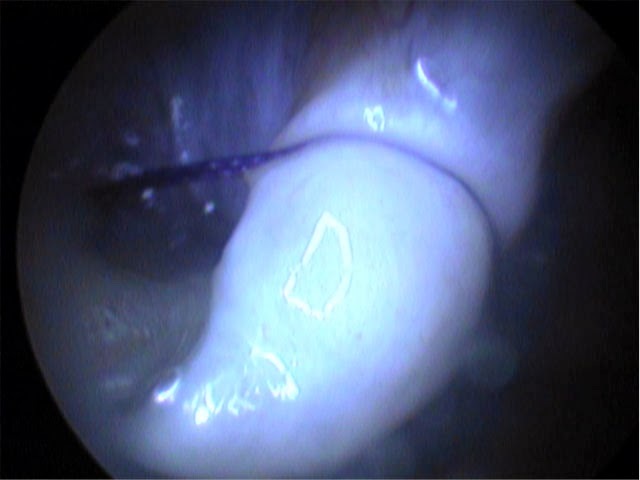 This picture below shows the area of abnormal lung tissue, which is getting biopsied using a special surgical string. The way this sampling method works is, you pull the section of the tissue you want to sample through the loop of the string and then cinch the string making the loop smaller and smaller until it cuts through the tissue freeing up your sample. 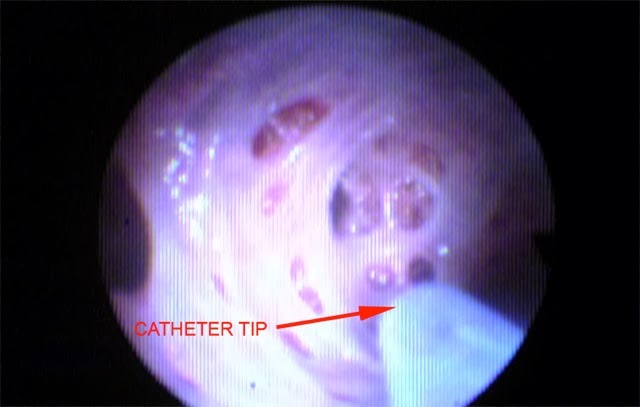 After the sample was taken, the biopsy site was closed with stainless steel surgical clips. Now every time we take x-rays of this turtle we will be able to see these clips! Dr. Innis transferring the lung sample into the vials to be shipped for further testing. 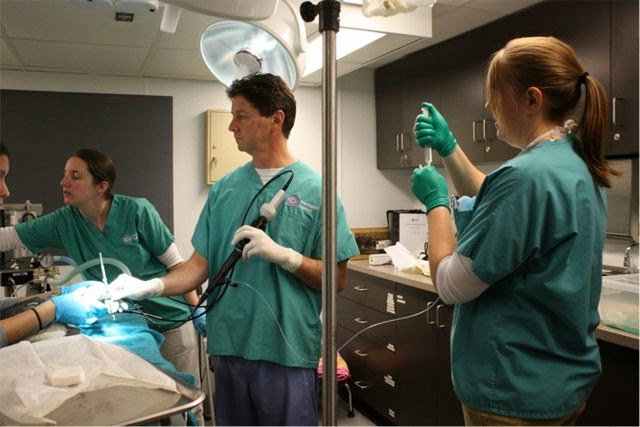 Dr. Cavin suturing up the incision site on #067 after the procedures were completed. #067, or Kaboom, did very well throughout the whole procedure. It took her about two hours to fully wake up from the anesthesia. By the end of the day she was swimming back in her tank! #067 remains on antibiotics and we are awaiting her final test results from the biopsy.